I don’t sign up for a lot of races. 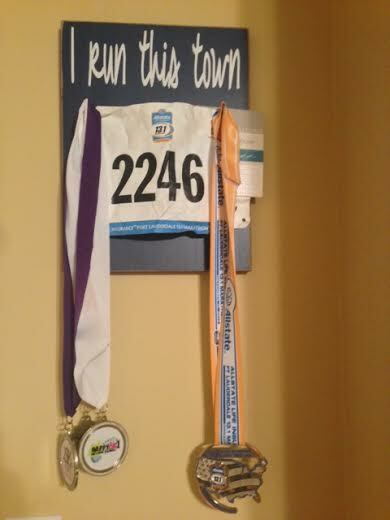 I don’t have a ton of medals or bibs hanging in my room. I don’t look through every Active.com email that makes its way into my inbox. In fact during my final 12 mile run before last year’s half (my first half) I actually thought about just pulling out of the race completely. I wondered why I was racing… for the medal? because that’s what runners do? because I was given a free entry? for the camaraderie? I wondered why I was putting added pressure on myself when I could just run 13.1 miles for fun all on my own. At the time I wondered if I was just scared that I wouldn’t finish the distance, but this is still something I think about today even though I am no longer intimidated by 13.1. (I’m not saying 13.1 is easy by any means, I’m just saying that I know I can do it). Sure, I have running goals, but they are easily achieved through solitary runs. I don’t need races and I very much like running alone. But somehow crossing an official finish line feels like it validates my training. It helps me feel like I’ve “really” achieved a goal. Races push me to try my very best. I guess that’s why I sign up for them every few months even though they give me anxiety… it’s to see how my training is progressing. The 5K I am signed up to do in a couple weeks will be my first 5K in over 7 months! I am obviously hoping to see just a little improvement : ) The half at the end of the month will mark 3 months since my first half. I’m hoping to crush some goals that day too. After the Princess Half I likely won’t race again until early fall as part of my marathon training, and then of course I will do the marathon in October. My running coach and I haven’t really talked about plans for after that. I’d like to keep my marathon training going and run a 50K before the end of the year, but that may also get pushed to February 2015. There’s a 50K in my hometown that gets run every Feb that I’ve got my eye on… but of course all of this is dependent on my getting through marathon training intact. My dream … what I am working to achieve. I guess as we get closer to the marathon my coach and I will talk about the 50K and how realistic it is. I picked my coach specifically because she is a rockin’ ultrarunner herself (who has won a handful of ultra races), so I trust her completely when it comes to these things. I know that whether the 50K happens this year or next year, she will get me to my goal of running a 50-miler before I turn 30 in 2016. There is plenty of time! So… I think I got off track a little bit. I guess what I’m trying to say is, I don’t sign up for races a lot. I sign up for them to test myself, but I’ll never be that girl that signs up for 14 races in 2014. I am inspired by people who do, but that’s just not me, and I think that’s okay. At first I thought I needed to sign up for races every weekend to prove I was a runner, but now I know running is just like everything else … everyone has their own preferences. Hmm..this was a completely rambling post, sorry about that! I guess this is just what’s been on my mind lately. What running / workout related things have been on your mind lately? Do you like to race a lot or just a couple times a year? Previous Post 11 solid miles this weekend + lots of other fun stuff! It’s such a smart idea to not sign up for a lot of races. I did way too many last year and not only got burnt out but I stressed over them way too much. I’m taking this year off big races. Running/workoung on my mind? Anything at this point, feel a little tightness in the OLD It Band so I’m taking a few days off. Want to get out and run REALLY bad. Thank for the post; I can totally relate. I love running because I love running and sometimes races give me anxiety too. I really like that you’re good with not doing races. I love races for the free stuff and the camaraderie of being with other runners. But I’m not crazy for being competitive or anything of that nature so I don’t feel like I get particularly hyped up. But like you said, races seem like something that runners (and especially bloggers!) do, so why shouldn’t I do them all the time? I’m just glad that you addressed this. Yes, races are so expensive, and since they stress me out I’m really just paying to drive myself crazy haha. I much prefer just heading out the door on my own. But yes, the race environment is so conducive to PRing that it’s a necessary evil every once in a while. I’m running PHM, too! I also don’t sign up for a lot of races because I’m poor and need that money for other things, unfortunately. If I can get someone to pay for all my races, that would be wonderful!!!! You have such great goals set! I am really looking forward to Princess, I think that one is going to be a lot of fun! I think it’s good that you don’t do lots of races. You don’t seem to feel pressure to do lots of them. It will allow you to just enjoy running and avoid the anxiety that comes with the races. Doing a couple of year will help you measure progress. You got this girl. Yep, I think you nailed it on the head. Racing helps me measure progress, which is why it’s a necessary evil… I just don’t want to do them all the time. Well I do NOT do 5Ks and 10Ks unless I am dragged there and do them for fun. And halves and fulls get expensive. I try to run a couple halves while I am training for a full. So I guess I only do about 6-8 races a year? Most are longer races, though! YES, I think it’s been seven months since my last 5K because I swore I would never do one again! I like the idea of doing halves during marathon training. I’m sure I’ll do at least one… and maybe as I get better at them I’ll want to do more! I don’t run that many races either. I only run 1-2 big races a year (but sometimes a few 5Ks and stuff that I do NOT stress myself out about or even train for). I’ve backed out of a few races last minute, so it’s kind of expensive to sign up for more than a few, I stress out, and feel like I’m setting myself up for failure. But I do need to have one on the calendar for extra motivation. I am so with you. I like having one race on the calendar so I feel like I’m working towards something, but I could never stand having 10 on the calendar all at once! As you know, I love races. The atmosphere gets my blood pumping and I know, like you said, that I’m more likely to really TRY and give it my best at a race as opposed to a solo run. But I seriously LOVE that you don’t need races to validate yourself as a runner. You ARE a runner. You KNOW you’re a runner. That’s what counts! I am really glad that you love racing because I love reading about your races!